35th Bournemouth Leader David Winson has submitted this update on the School’s scout troop. The Troop is well and active, having invested 13 new recruits last week and having another three expressing interest. The strength of the Ship’s Company is well in excess of 24 Scouts. The Group is now meeting on Friday evenings at the School Scout Hut until the first week in April, when we shall switch back to our summer boating site on the Iford River at Perch Pool. We were a key participants in the town’s Remembrance Service commemorating 100 years since the end of the First World War. In District events, the Troop participated in the RN Football Competition at HMS Bristol, which culminated in the semi-finals only to be knocked out on penalty shootouts. The 35th Leaders continue a highly successful boating programme that includes pulling, kayaking, sailing and power boating. Former Troop Leader Bob Cudmore has willingly accepted the role of Leader in the Explorer Scouts Unit and shall encourage the senior Scouts to participate in the Duke of Edinburgh Award. We are one of only 101 Royal Navy recognised Sea Scout groups and have an inspection by a Royal Navy Flag Officer every 18 months. We were praised for our professionalism and dedication on the last inspection. High standards of uniform, training and attendance are maintained. The Royal Navy scheme is beneficial in allowing the Group access to military sites, visits to naval warships and entry to national swimming galas, camps and football matches. These are organised by the Royal Navy units and give our Scouts the opportunity to experience life as a naval rating aboard warships. Many of our Scouts have gone on to become leading pillars in the community, including a Royal Navy Commander and a Police Commissioner. The depth and variety of activities that scouting provides often opens up new horizons to our members. Our Group operates very much in a traditional way and many of our older Explorer Scouts help our younger members by passing down their knowledge and experience. We are a volunteer-led organisation and are always on the look out to broaden our skills and resources, so more adults would be a great bonus to the growing leadership of the Troop. If you wish to contact me as the Group Scout Leader, feel free to do so on 07783907008 or by email leaders@35thbournemouth.org. On the 15th June 2013 a dozen Sea Scouts & Leaders travelled to Richmond Bridge on the Thames for the launch ceremony of the first of the new batch of Home Counties Gigs. Despite occasional heavy showers of rain the Scouts took the opportunity to try the new Gig on the Thames before what seemed like several hours adjusting the road trailer for the journey home, which passed without incident. 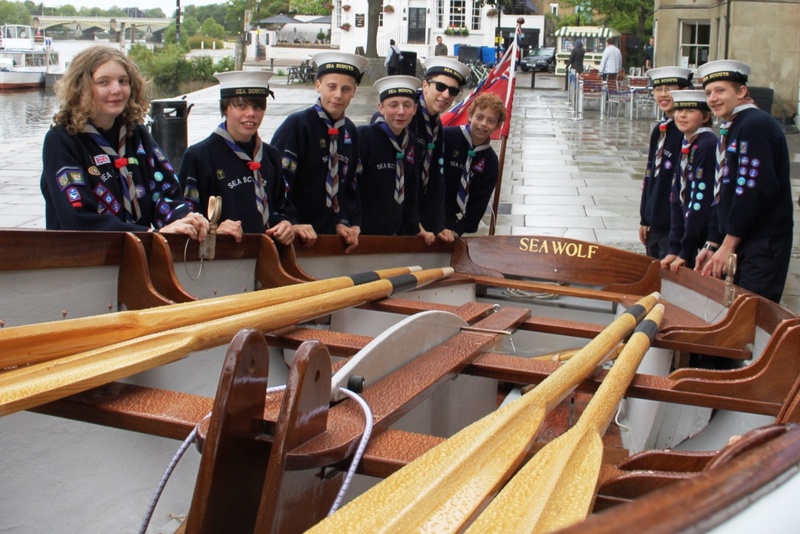 Bournemouth School Scouts traditionally use the prefix Sea when naming their larger boats and the new gig was named “Sea Wolf”. 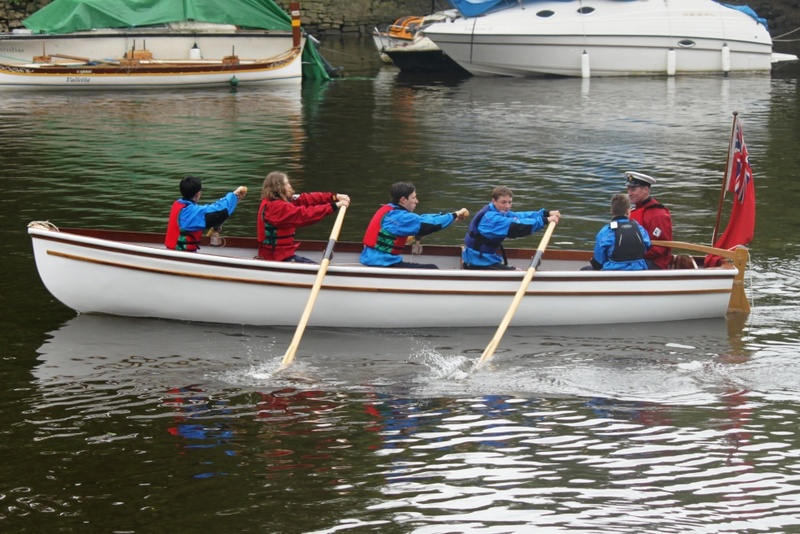 Sea Wolf is 20ft long and has three 14ft oars and one 12ft oar but the Scouts have found Sea Wolf is an easy boat in which to learn to row. Two instalments have already been paid towards the purchase of a second Home Counties Gig which will be named “Sea Cat”. We hope that Sea Cat and sailing rigs for both new gigs will be delivered in time for the start of the Scout Boating Season in 2014. Anyone wishing to make a donation toward the final instalment can send a cheque payable to Bournemouth School Scouts at the School or make an online payment to the Scouts Gig Account with Lloyds Bank – Sort Code 309108 Account 27172168. I hope many ex-Scouts remember the enjoyment and badges they obtained whilst boating. For me this meant “Sea Tern”, a 27 ft Montague Whaler in Poole Harbour and on her retirement “Sea Scout” a Scoutcraft16 double-banked pulling boat. “Sea Scout” with a glass-fibre hull and wooden gunwale and thwarts at approximately 15 years old, is still going strong. In the summer the Group currently meets at the Bournemouth Town Camp Site Perch Pool on the river Stour in Christchurch on Friday evenings but lacks sufficient boating seats to put all Scouts & Explorers on the water at one time. The task of locating a boatyards producing Scout-suitable gigs is next to impossible and I was therefore extremely pleased to hear about “The Future Gig Project”. This project, lead by a team of Sea Scout Leaders and including Mark Edwards – Master Boat Builder – is redesigning certain aspects of the classic Home Counties Gig to ensure a saving in weight, reduced maintenance costs and a lighter sailing rig as well as obtaining funding to produce a new shaping mould. It is estimated that a pulling/sailing version including trailer of the Home Counties Gig (currently our boats are stored on land) would cost £18,000 making this the most expensive purchase the Group has ever made. However, as some Home Counties Gigs from the 1960’s are only now approaching retirement this does represent good value for money for our current Scouts and future generations. Over the last two to three years we have raised £6,500 towards the purchase of a gig. In the long term we would like to purchase additional gigs both to increase the number of Scouts (boys & girls now from BSG) we can put on the water and so we can have pulling races. If any ex-Scouts can help with a donation to the gig fund please send cheques payable to Bournemouth School Sea Scouts C/O Mr B Cudmore, Scout Leader, Bournemouth School, East Way, Bournemouth BH8 9PY.